To me, weekends are meant to be decadent and enjoyable. I like to immerse myself in the kitchen and cook until I have had enough of packing and unpacking the dishwasher. Some weekends I don’t get to do as much baking and cooking as I would like to. We end up going out for lunch – not that I am complaining, and every month we go to the motor racing. The other Sunday I managed to get into the kitchen at a reasonable time and the first thing I did was make granola. We eat this every work day for breakfast and I don’t like to run out otherwise I am faced with instant oats, which are not my favourite. I also made a few more sfogliatelle as I had a little bit of the custard and pastry left over. And while I was doing that I decided that we would have afternoon tea of crêpes. I am busy reviewing Jackie Cameron’s recipe book and the next cover recipe I decided to test was for Crêpes Filled With An Orange-Infused Chocolate Mousse. I did not use all of the chocolate mousse and so I shall treat Dave and I to dessert as well! I made a small batch of both and the Cointreau is not very evident in the mousse, or the batter. I think I will add a bit more to some cream and make the mousse a real after dinner treat. I am on leave until the 6th of January and will reply to blog comments then. I want to take this opportunity to wish all of you a very blessed Christmas. May the day be full of blessings. Yummy i love chocolate mousse. thanks for sharing this recipe…. Yummy ! A perfect and tasty combination. This dish looks delicious. Yum! Love the orange infused idea! Tandy, this is the perfect recipe to entertain over the Christmas period. Thanks! 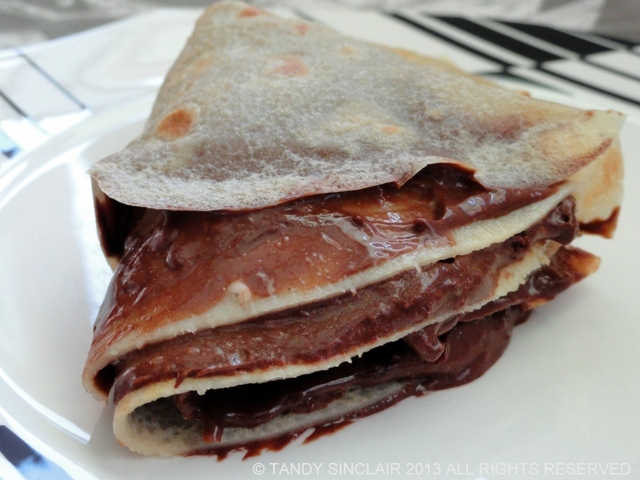 nothing better so start up a day than this crepes….. Thank you so much Dedy! I pretty much have the same view on weekends – that is what they are made for 🙂 And these crepes look like just the right type of weekend food. Yum! Wishing you a wonderful holiday season. Merry Christmas to you, your family and all your loved ones! And I hope you enjoy your trip to Europe! I’ve never made crepes cus I”‘m too scared I’ll mess them up. These look great! What a delicious, indulgent dessert! 😀 And you can get two desserts in one if you make extra mousse!